Come to campus and chat with us about your future study plans. 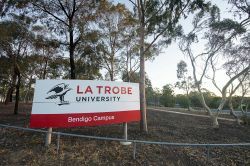 Tour the campus and our accommodation with one of our friendly student ambassadors who can tell you all about student life at La Trobe University. This is a chance to meet with one of our friendly team to have your course and career questions answered as well as enjoying a walking tour of our biggest regional campus. Registrations are now open for personalised consultations and tours of our Bendigo campus these school holidays.